How do you deal with West Systems Squeeze out? 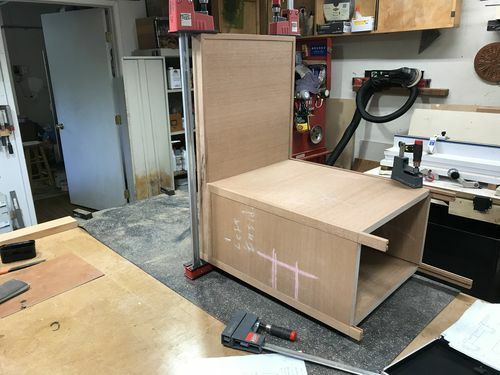 I’m building a set of nightstands and headboard for a friend with Baltic Birch plywood and mahogany. I’ve veneered Mahogany onto Baltic Birch plywood the the joinery being tounge and grooved into solid Mahogany trim. It’s kind of an engineering project for me. 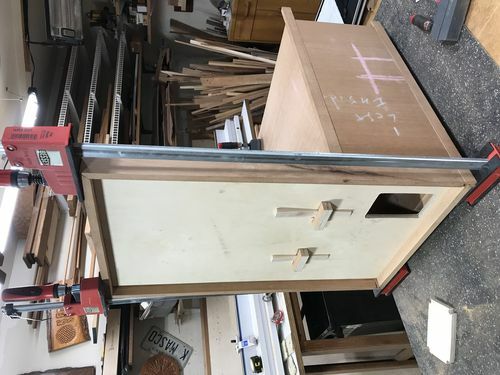 I’ve never worked with BB before except a few jigs and shop furniture. and my experience with epoxy is very limited. 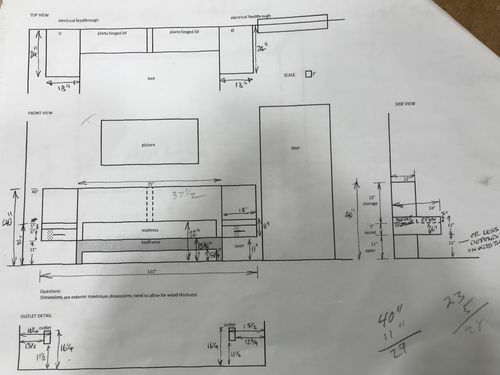 FYI, here’s the plans and photos of the project. Turns out BB is really strong material, so I’m planning to epoxy reinforcing 3/4” BB strips along all the joints on the inside, which are mostly a 1/4” groove about 30” long, BB to mahogany trim.. My question is: how do you apply epoxy? I don’t mind a bit of squeeze out as it’s all on the inside but I want to limit it. I applied the first attempt with a chip brush and the results are a bit sloppy. I’m thinking a squeeze bottle with a neck like the Tire Bond bottles would work really well but cleaning the bottle afterwards????? So what do you use to apply and spread epoxy and what do you do with squeeze out? Why Epoxy? Titebond I or II more than enough. that much squeeze out could be a nightmare to control in large areas. especially if you are not familiar with epoxy and all its idiosyncrasies. 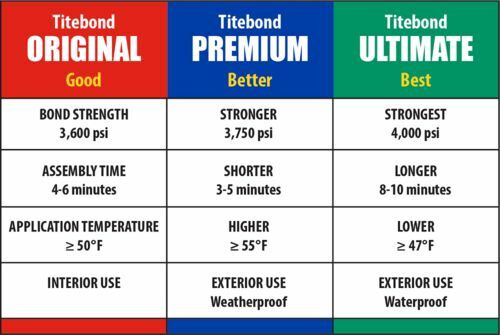 look at the TiteBond products and see which one would suit your project the best. TiteBond III will give you a longer open time. that applicator is a “one time ‘n done” tool. for me that had a long skinny neck and was perfect for adhesive applications in tight places. I agree that epoxy is way overkill and not worth the expense and mess. However if you are determined to use it and want to apply it with a squeeze bottle, you can get cheap ones from Harbor Freight. You’ll be throwing them out after every use. Usually when I apply glue, epoxy or any other kind, I use tongue depressor style sticks that I make in my shop whenever I have a length of thin rip scrap. I just chop them into suitable lengths and keep them on hand as disposable glue spreaders. The previous posters are right about not needing epoxy for this but handling epoxy need not be as hard as many people make it. You could do it very easily and cleanly with minimal squeeze out and almost no mess. I agree with everyone else on the need for epoxy. You could use masking tape along the joints where the squeeze out will occur to prevent the epoxy from making contact outside the joint and then pull it off as it starts to set up. Still going to be messy. This tape method helps with the other glues too but you can let them cure before removing the tape. You can use acetone or MEK to clean up excess epoxy. MEK is absorbed into skin very easily and recommend Acetone. Once again, thank you all for a great education and practical advice. As you can see from the photos there is a lot of stress potential on some of these joints. I thought epoxy would make them stronger. Thank you Shipwright for the link, very helpful. I’ve decided to use Titebond Ultimate “clamping” the braces with brads. Much neater, easier clean up and overall easier to work with. 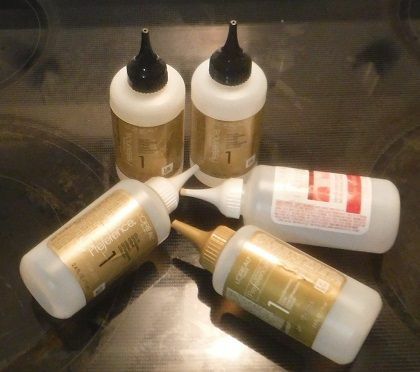 The West System epoxy is one of my favorite go-to products. It has very stable and predictable characteristics. There are many additives available so this may be tailored to the application. Here is an example using fiberglass matting and color tint. Here is an example using smooth sanding filler. My usage is w/ a small mixing cup and a digital scale. I can easily attain perfect mix ratios in very small or much larger batches (5 parts resin to 1 part hardener). Their 206 Slow Hardener has terrific hardening characteristics, permitting “clean up” after about an hour, to remove / relocate material that is no longer liquid, prior to becoming hard. I use blue masking tape around a joint when using epoxy. It makes for easy cleanup. I also agree with Andre. Epoxy is overkill and not worth the Effort and Cost. I sometimes use epoxy on plywood for the long open time. Epoxy can be cleaned up with alcohol (DNA). If necessary I mix the epoxy with microballoons to reduce running. The West System epoxy and hardener mixes up as a liquid consistency. It is very runny when mixed w/o filler additives. TB II or III is plenty strong enough for the job at hand.